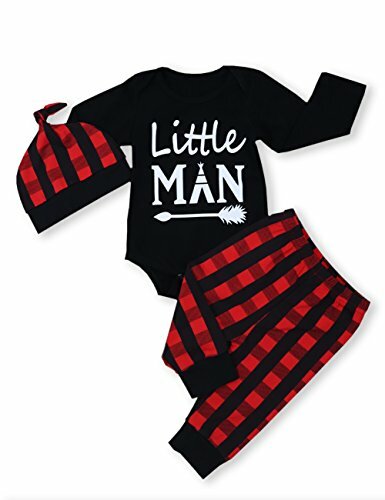 ☋ Little man and arrows printed Long Sleeve Romper+Plaid Pant with matching hat for unisex baby 0-18 Months. ☋ Elastic waistband pants, so soft and your baby will feel very comfortable wearing it.Best gift for your kids. ☋ Adorable outfits suitable for indoor,outdoor wear, baby photo,birthday gift,christams party or any occasion. ☋ For infant cute baby boy girl 0-18 months for spring / fall / winter;unique and attractive. ☋ Both hand wash and machine wash is OK.Package include:1PC Tops+1PC Pants+1PC Hat.